Inspired by John Smart’s appreciation for nature, “Intervals” consists of a handful of large format photographic prints that explore the sacred geometries found in every-day-life. Further, these photographs represent tiny intervals of time, the moments in between life’s normal rhythm that exist as a portal into the artist’s parallel life as a surfer, skateboarder, naturalist and observer. These moments transform into modern sculptural landscapes when installed into the gallery space. In some cases, the same image is layered upon itself to create a new beat through repetition or evolving frames, thus becoming layers of life, both figuratively and literally. In certain cases these intervals are layered together through consecutive frames, creating a new beat and becoming layers of life, both figuratively and literally. 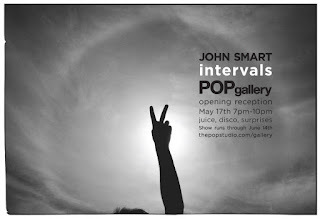 John Smart is a Los Angeles born, filmmaker and fine-art photographer who resides with his family in Redondo Beach, California. At the early age of 6, inspired by his father Jim Smart, and his passion for photography, John developed a keen eye for framing natural, spur-of-the-moment compositions with his father’s 35mm cameras. This interest developed into a desire to translate these images into a career in both still photography and filmmaking. In 2003, Smart graduated from UC Santa Barbara with a degree in Film Studies, completing his first film, “Natural Expressions,” a 16mm introspective documentary about world champion surfer Joel Tudor. Upon graduation, Smart was contracted as a cinematographer by surf-filmmaker and artist Thomas Campbell to contribute on the films “Sprout,” “The Present” and “Dear & Yonder”. Smart has also collaborated with clients and media including ROXY/Quiksilver, Bing Surfboards, Kookbox, Blue Magazine (Japan), and Nixon Watches to name a few.